Explanation: Come December 2003 - January 2004, an armada of five new invaders from Earth should arrive on the shores of the Red Planet -- the Japanese ( ISAS) Nozomi orbiter, the European Space Agency's Mars Express orbiter carrying the Beagle 2 lander, and NASA's own two Mars Exploration Rovers. While Nozomi began its interplanetary voyage in 1998, the other spacecraft are scheduled for launch windows beginning this June. Clearly, earthdwellers remain intensely curious about Mars and the tantalizing possibility of past or present martian life, with these robotic missions focussing on investigating the planet's atmosphere and the search for water. This mosaic of over 100 Viking 1 orbiter images of Mars was recorded in 1980 and is projected to show the perspective seen from an approaching spacecraft at a distance of 2,000 kilometers. 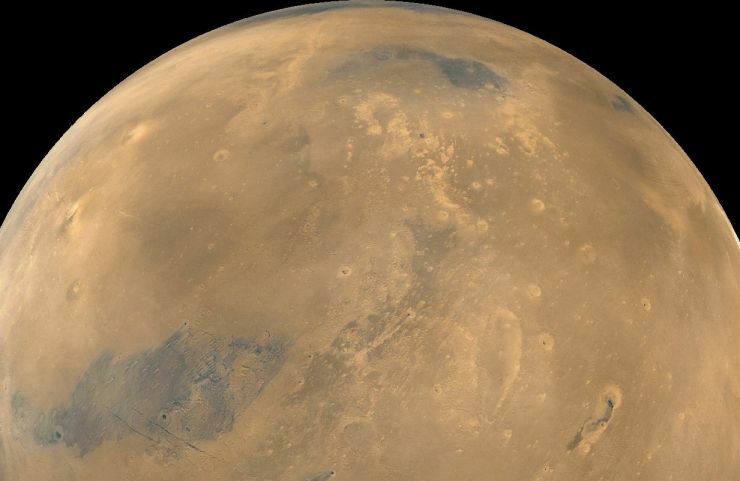 Exceptional views of Mars will be possible from earthbound telescopes in August and September.